Container Freight Stations (CFS) and Inland Container Depots (ICD) are complex operations, involving intricate flow of information and goods between multiple stakeholders. Transportation, warehousing, stuffing, tallying, yard management, repair and maintenance, terminal operation, etc. involves a lot of manual processes. We have extensive experience and proficiency in transporting and handling containers from Gateway port to Container Freight Stations and Inland container depot. ICD/CFS Management services require expert handling with sound understanding of complex procedures. We have expert capabilities to effortlessly handle and manage these transit facilities. A unique solution for the retail industry, these machines automate cash pick-up transactions including authenticating and counting banknotes, thereby allowing retailers to enhance productivity at retail touch points, focus on customer service and ensure safety of cash and billing processes. Inland Container Depots (ICD) and Container Freight Stations (CFS) are complex operations, involving intricate flow of information and goods between multiple stakeholders. Transportation, warehousing, stuffing, tallying, yard management, repair and maintenance, terminal operation, etc. involves a lot of manual processes. 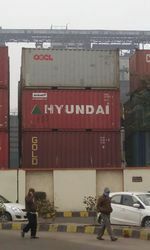 The Group manages three Inland Container Depots (ICDs) in India at Loni (Ghaziabad), Bawal (Gurgaon), and Wardha (Nagpur) and offers ICD services including stuffing, de-stuffing, Reefer cargo handling, and Warehousing (Bonded & Non-Bonded). India has many dry ports where it needs to connect closest harbour to move shipments to right destinations Vangard Logistics extend support to find a better transit for their customer by setting up a guideline with CONCOR perform on time connections. PSWC was the pioneer in bringing international standards of containerisation in North India. PSWC runs five CFSs / ICDs in the various industrial hubs of Punjab. The CFSs / ICDs are equipped instruments in the growth of Punjab's foreign trade. in the year 1993. Thar plans to further expand its wings in the central and southern INDIA after completion of its above 2 new projects terminals. The company has strategically planned and is preparing to become the largest private sector player having 17 ICD’s across India linked by Rail and Road. Hasti Petro Chemical & Shipping Ltd.
- One of the biggest private customs bonded freight stations in Chennai. 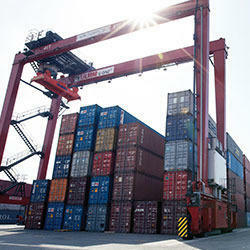 - Separate warehouse for imports and exports. - Sophisticated and modern handling equipment. - Online tracking of goods. - Linked directly with customs for EDI formalities.